Casey Prather drives to the basket as he scores two of his 12 points for the Gators, who routed 67-41 Tennessee on Saturday. GAINESVILLE, Fla. (AP) — Having dropped three consecutive games to Southeastern Conference rival Tennessee, No. 6 Florida had been waiting for a chance to end the losing streak. The Gators welcomed it and wanted it — and it showed. Michael Frazier II scored 17 points, Scottie Wilbekin added 13 and Florida handled Tennessee 67-41 on Saturday for the team’s 11th consecutive win. The Gators (17-2, 6-0 SEC) beat the Volunteers for the first time in nearly two years and extended their school record for consecutive home wins to 26. ”We had a little chip on our shoulder because they kicked our butts the last three times,” said Florida center Patric Young, who added 10 points. ”I can actually remember each loss, and the last one was the worst because they were on the court celebrating. They punched us, and we didn’t respond well the last three years. 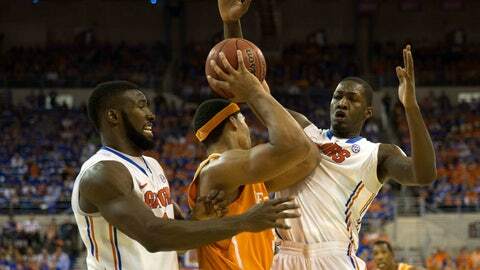 Florida held the Volunteers (12-7, 3-3) to a season-low in points and shooting percentage (27). The Volunteers’ backcourt really struggled, with leading scorer Jordan McRae, Antonio Barton and Josh Richardson combining to make 2 of 29 shots. Jarnell Stokes led Tennessee with 16 points and 10 rebounds — his 11th double-double of the season. 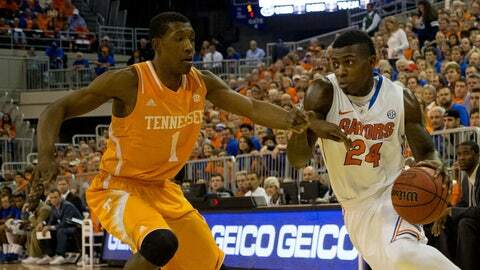 Billy Donovan asks the Gators to play with desperation and they turn in an inspired effort. Stokes kept the Vols in the game early, but faded down the stretch. Jeronne Maymon chipped in eight points and seven boards. The Gators led 26-19 at halftime and pulled away with a 21-5 run after the break. Wilbekin’s floater in the lane got things started, and Frazier’s consecutive 3-pointers really opened it up. After Will Yeguete’s dunk and Dorian Finney-Smith’s consecutive layups in transition, the Gators pulled ahead by 17 and looked really in rhythm. The only thing left at that point was to start making some highlight plays, and boy, they did. Kasey Hill hit a pull-up jumper. Young followed with a nifty, reverse post move and later got the sellout crowd rocking with a one-handed dunk on an alley-oop feed from Frazier. It was just what Florida had hoped for after the last three meetings. Florida coasted from there, winning for the 16th time in its last 17 games. The only loss in that stretch was a buzzer-beating defeat at then-No. 12 Connecticut in early December. Florida shot 48 percent from the field, including 5 of 16 from behind the arc. The Gators scored 38 points in the paint, made 10 of 13 free throws and finished with a season-low six turnovers. Stokes posed problems for Florida early. But Donovan’s full-court press gave McRae, Barton and Richardson fits. The Vols had just 13 turnovers, but they ended up taking countless ill-advised shots and had little, if anything, come easy. The defensive gem helped Florida sweep its fifth straight Thursday-Saturday setup in conference play. This one came after the team was stuck in Tuscaloosa overnight Thursday because of mechanical plane issues. The Gators returned home around noon Friday and had to alter their practice schedule, but they showed no problems against Tennessee. Florida, which has lost in three straight regional finals in the NCAA tournament, is trying to build a resume that will get it a No. 1 seed and plenty of momentum for a season that started with high expectations. This was another solid win in the right direction.